as a fierce conqueror into the midst of the land of destruction. I sat there, seemingly staring into space — literally, staring at a wall. Later, I sat there staring at at a crucifix. Later still, an altar captivated my gaze. No sound is heard inside. No sound outside, apart from that of birds or an occasional horn blaring from the otherwise unnoticed street below. It is all an awkward experience — one few New Yorkers ever contend with. Until they leave New York. And then, somehow, monastic silence lengthens days. One discovers the luxury of the stilled madness. And it is odd. Truly odd. No words, few thoughts; distractions, the constant thinking back to past days and things left as yet undone. It all seems a waste of time. And so begins the fight with silence, as God silently lays claim to the heart that is otherwise entangled with the world. Around is sheer stillness — an unsettling bareness of sound that strangely invites into that fuller communion only possible when first fruits are offered: that undivided gaze that says ’Speak Lord; Thy servant is listening’, as He shatters the night. Is silence simply the absence of sound? Or, perhaps an experienced void of distraction? Or the kind of inner mental nivarna we reach through years of disciplined meditative exercise? 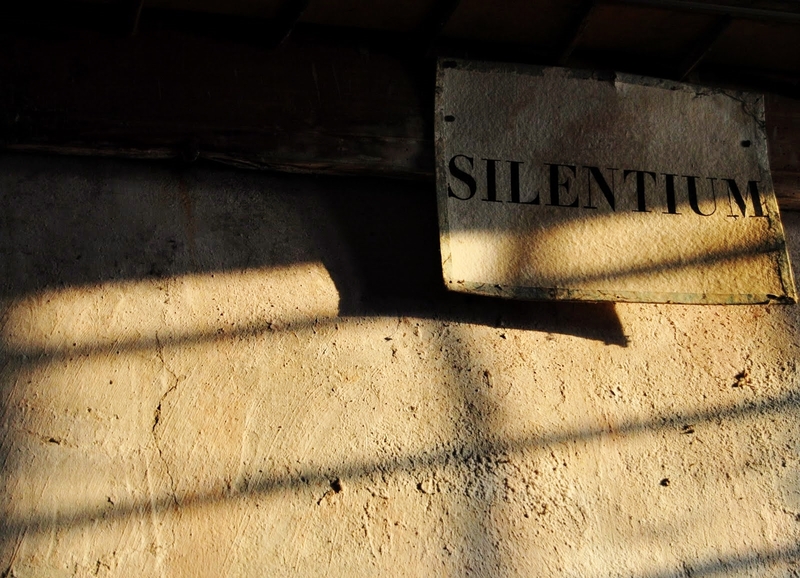 What does the culture around us think of silence? Is the pulsing beat of modern life the one beat that guides our lives? Does silence have any significance? Is it a passivity we seem incapable of? Or, perhaps, could silence be of religious importance — a natural aspiration of the soul so often denied its way? An active stillness that allows God entry to the heart? We are conditioned to think of things based on how we feel about them. Silence can be unsettling. For those whose lives operate on syncopated beats of songs that blast through the madness of madness, whose daily hours vanish unaccounted for, breaking free to retreat from the daily cacophony can be a jarring experience, eliciting feelings of separation, alienation, even loneliness. We do not know what to do with ourselves; fear fills the empty space of time. But could we actually reach a point when silence is desperately needed, or better, even deeply desired? And if our answer is no, could it be that we are missing God in the process? The Christian contemplative life does not seek to empty the mind — it seeks to fill it. Silence, then, is pregnant with God’s work. It requires a retreat from the world, even in the world. It requires the full exercise of our consent. It is itself a form of consent. It is a placing ourselves aside, allowing Him permission to speak. And this is why when we fall silent, we can meet Him best — He has been given right of say. The descent of God and the silence of reverence are conjoined here. Yes, we revere the past manifestation of the Word made flesh. But the Incarnation continues, and Christ still descends. The Eucharist is that lasting encounter we have with the real Christ. And the one act of assent we make is in the form of unworthiness: ‘Lord I am not worthy… but only say the word…’. We are made to receive the Christ who still descends in the silence of our nothingness. He has come to his people, and set them free. It strikes as significant then that, apart from silence, no other mode of human behavior fits the magnitude of this union. Let all mortal flesh keep silence before Him: on surface, silence seems a lack, an absence — it seems insufficient — and yet, it is everything. Silence is the ultimate assent. It is as if the full breadth of human capacity for expression becomes unnecessary, not in some mode of depersonalized passivity, but as that active receptivity which requires the full exercise of the will — in spite of our conviction of worthiness, or feelings of unworthiness; despite our desire to express ourselves, or even in light of our own incapacity to do so. Silence, then, is not passivity. It is an action, it requires all that we are. Only in realizing the great need for God we each have, can an interior stillness become the response through which the door of the heart is opened to a receptivity of that Love that transcends all telling. And then, in the sheer wonder of the magnitude of God, silence allows communion — a communion which enables that final falling into a fuller joy — terrifying because it is the experienced gradual unveiling of what is unknown to us, and yet known to the One who works all things for the good of those who love him. Silence is the one way to meeting God, who needing nothing, wants nothing more than all of us. Silence is the only assent to suffering, the only crushing freedom of the rebelling heart, the only probing of the wayward, so that pierced by absence of all familiar things, they might find their way in Him who leads along the narrow road. Silence is chosen union; a marvel of oneness. Silence is a grace trampled everywhere the strange clangings of the world deprive the heart of rightful union with its beloved. Terrifying silence — the sheer capsizing of our inclinations, such that the flood of grace might take hold — is the manifold denial of our all in favor of the all of God. It is the yes to vocations of separation from the world, of contemplative work that has paradise as it focus, of abject chosen poverties of will which precede the greatest poverties of body. Silence is the profound piercing of our hearts to reveal to them the font of life that flowed from a once pierced side, as darkness and silence covered the land. Silence is the only response to the privations of death which teach us to yearn for life in God. Silence is the capacity to rise above the fascinations of the world, impervious to their allure — all passing emptiness and loss. It is the means to regaining interiorly all that is lost exteriorly. Silence is the terror of not knowing if, or when, or how God will speak, and yet knowing that is we keep silent He will — His still voice stirring, entering in the sacristy of the soul. ..And not only will He speak, but give His own self for nourishment, unto heaven itself. Silence is the only mode of expression the heart is left with when it is lost in wonder, in awe, in love. In the obscurity of faith, and in the evening of our sojourn then, let silence be the language of mortal flesh before Him — that the soul might become the altar of His repose, as the world sounds itself away. In the Gethsemane of our lives, redemptive cries win the grace of crucified salvation, as silently He is still lifting the world to paradise. For paradise awaits, yes, in glimpses of glory even here — in the brilliance of that stillness where He dwells. There is the refulgence of grace; a crucified Love that never ends calls forth souls from the depths. Nothing save Thee, O Lord. Nothing, save Thee.